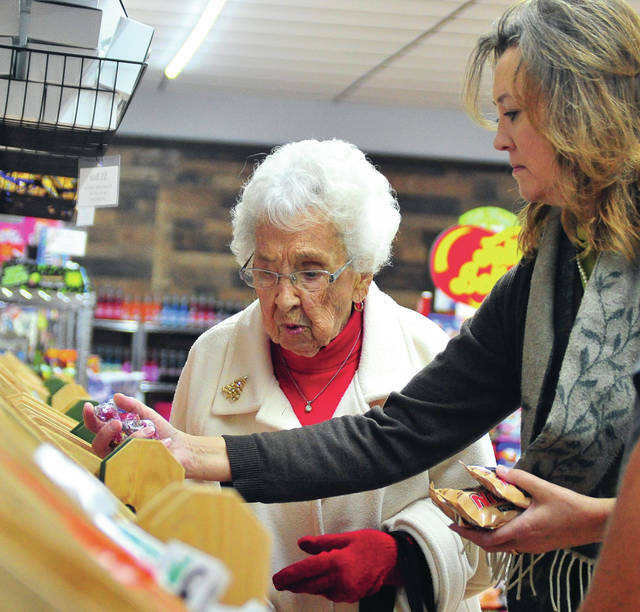 Mike Ullery | Daily Call Mary Baker, 102 years young, checks out the candy selection at This & That’s Candy during a pre-opening event, with her granddaughter Melinda McBride on Tuesday evening. The candy story, located at 409 N. Main St., opens to the public on Friday. PIQUA — The cravings of every sweet tooth in the downtown district can now be satisfied at This & That’s Candy on Main. The locally owned store, located at 408 N. Main St., began offering soft-open access to customers on Tuesday, and will hold its official grand opening event on Friday at 11 a.m. to coincide with Piqua’s Christmas on the Green. Complimentary fresh popcorn will be served to guests. Holiday hours will be 11 a.m. to 8 p.m. seven days a week, with new hours to be announced in January. The store’s owners, Tom and Cindy Lillicrap, said that the idea for the store stemmed from a sustained interest in the small-town business model of yesteryear. The Lillicraps worked alongside Chris Schmiesing, city planner for City of Piqua, and Lorna Swisher, executive director of Mainstreet Piqua, to bring the endeavor to fruition, stressing the importance of establishing This & That’s as a mainstay in the downtown district. This & That’s will offer hundreds of candy varieties, including the option to fill out a $5, $10, or $15 box from over 100 bulk candy options. The store also boasts a craft soda wall, featuring 57 beverage options to mix and match. Products unique to This and That’s stock include merchandise from the locally owned Rosebud’s Ranch and Garden, as well as a line of snacks from Walnut Creek products. This & That’s also features a section of vintage toys, including such items as Whoopee cushions and the original Lite Brite. Present at This & That’s Tuesday soft open was 102-year-old Piqua resident Mary Black, who at age 17, was employed at five-and-dime G.C. Murphy for $9 a week. G.C. Murphy once inhabited the space on North Main Street now occupied by Barclay’s. For more information, find This & That’s Candy on Main on Facebook. https://www.dailycall.com/wp-content/uploads/sites/30/2018/12/web1_120418mju_thisnthatcandy-1.jpgMike Ullery | Daily Call Mary Baker, 102 years young, checks out the candy selection at This & That’s Candy during a pre-opening event, with her granddaughter Melinda McBride on Tuesday evening. The candy story, located at 409 N. Main St., opens to the public on Friday.